A comprehensive review of current evidence-based guidelines for managing patients who receive moderate sedation and analgesia. Using an Infection Control Risk Assessment to Create an Infection Control Plan for an ASC 4th Ed. A Primer for Designated Infection Control Managers in Ambulatory Surgical Settings, 4th Ed. Sedation and analgesia are frequently administered to patients in both hospital and ambulatory settings to relieve the pain, discomfort and anxiety associated with diagnostic or therapeutic procedures. Sedation and analgesia are often necessary to minimize patient movement so that procedures can be performed safely and successfully in the most expedient fashion. Staff that are involved in the care of patients who require sedation and analgesia should be knowledgeable of the essential components of the process so that the patient's experience is optimized while risks to patient safety are minimized. Optimal dosages of sedative and analgesic agents must be carefully determined based upon patient characteristics and procedure requirements to avoid the deleterious consequences of cardiac or respiratory depression (i.e. hypoxic brain damage, cardiac arrest, or death). This educational activity will provide reinforcement of evidence-based standards for administering moderate sedation and analgesia in both hospital and ambulatory settings; and will provide a review of current guidelines for safely managing and monitoring sedated patients in such settings. - The physiological effects of moderate sedation and analgesia. - Pre-procedure patient assessment and preparation. - Peri-procedure monitoring and management of patients receiving moderate sedation and analgesia. - Pharmacology of analgesics, sedatives and antagonists used for moderate sedation of adult and pediatric patients. - Post-procedure management and discharge of patients who received moderate sedation and analgesia. This continuing nursing education activity was approved by the Association of periOperative Registered Nurses, Inc., an accredited approver by the American Nurses Credentialing Center's Commission on Accreditation. AORN recognized this activity as continuing education for registered nurses. This recognition did not imply that AORN or the ANCC Commission on Accreditation approved or endorsed any product included in the presentation. The contact hours for this activity expire: November 2, 2020. Nurses and Health Professionals in ambulatory surgical settings where patients receive moderate sedation and analgesia. 2.5 Contact Hours will be awarded upon successful completion of this activity. At the completion of this course, the health professional will be able to recognize the risks to patient safety that may occur throughout the process of administering moderate sedation and analgesia to patients in ambulatory settings. 1. Describe the four levels in the continuum of sedation. 2. State the goal of moderate sedation. 3. Cite components of a pre-procedure patient assessment. 4. Summarize the current standards for pre-procedure fasting. 5. Discuss methods for assessing a patient’s level of consciousness. 6. 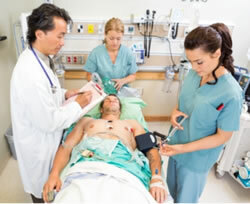 Describe methods of monitoring the physiological status of sedated patients. 7. Specify rescue maneuvers for patients who progress to deep sedation. 8. Itemize equipment that needs to be immediately available to rescue an over-sedated patient. 9. Identify side effects of commonly used analgesics. 10. Explain dosing considerations for sedative medications. 11. Evaluate scenarios where the use of an antagonist may be indicated. 12. Indicate criteria used to determine appropriateness of patient discharge. Register for the course by clicking the link at the bottom of the page entitled REGISTER FOR COURSE. Using this Self-Directed Learning Module, you must review the objectives and read the materials. As you read through the material on the course pages, you will be occasionally prompted to answer exam questions. There is a total of 33 multiple choice questions in this course. You must achieve a grade of 80% (27 correct answers) to receive a certificate. When you have answered the last exam question, the Course Results page will display. This page will contain your final grade and allow you to immediately print your certificate if you have scored a minimum grade of 80%. Your certificate will also be available on your Control Panel where you may print it at any time. Course work does not need to be completed in one online session. You can log off at any point and return to the course at your convenience. The Course Reference Page available at the completion of the course will contain many useful reference documents from notable sources pertinent to material covered in this course. The course work was authored by Regina Napolitano, RN, MA, who serves as the Senior Education Development Specialist at Continuing Education Online (www.ProCEO.com) and discloses no conflict of interest. Claude V. Baconcini, CRNA, served as a program planner and reviewer and discloses no conflict of interest. No commercial support has been obtained for this offering. The registration fee for this course is $29.00. Your registration fee includes two opportunities to pass the examination and permanent access to all reference material.